Ukrainian authorities hope it will be a further step out of Russia’s orbit. 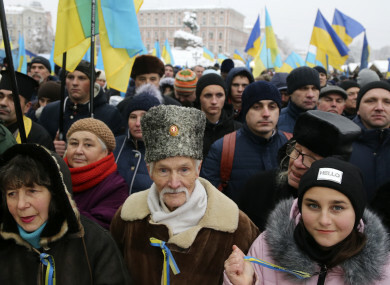 SEVERAL THOUSAND UKRAINIANS have rallied outside one of Kiev’s main cathedrals today ahead of a historic synod expected to establish an Orthodox church independent from Russia. Ukrainian priests were to meet in Kiev’s Saint Sophia Cathedral to work towards founding the church, in what Kiev authorities hope will be a further step out of Russia’s orbit. Ukrainian President Petro Poroshenko briefly came to the rally before going into the cathedral, where he is expected to attend the synod. “Let’s stand and pray for a Ukrainian church to be created today,” he said as he greeted several of the rally’s participants. He has made an independent Church a campaign pledge as he looks ahead to an unpredictable election next year. “The people have been waiting for this. Our Ukrainian church should finally be independent from Moscow,” 65-year-old Mykhaylo Khalepyk, who travelled to Kiev from the southern Kherson region, told AFP. Several of the rally’s participants said local churches throughout the country had encouraged parishioners to travel to the capital and even offered free transport. Ties between Russia and Ukraine have broken down since Moscow annexed Crimea in 2014 following a pro-Western uprising in Kiev, and this year those tensions spilt into the religious arena. The synod will seek to realise a landmark decision by Istanbul-based Ecumenical Patriarch Bartholomew I to recognise Ukraine’s independence from the Russian Orthodox Church. The ruling in October sparked fury in Moscow, which has overseen the Ukrainian branch of Orthodoxy for the last 332 years, and saw the Russian Orthodox Church cut all ties with the Ecumenical Patriarchate of Constantinople. The synod aims to unite various branches of the Orthodox church in Ukraine into a single independent body. But Ukraine’s Moscow-loyal church has said it will not send any representatives to the event. That leaves the meeting between the Ukrainian Orthodox Church of the Kiev Patriarchate, the country’s largest branch by number of believers, and the smaller Ukrainian Autocephalous Orthodox Church. Ukraine’s SBU security service warned this week that Russia plans “provocations” in the country when the clerics are due to meet. The SBU’s deputy head Viktor Kononenko asked Ukrainians on Thursday to “refrain from holding any (political) gatherings during this period” so that they “could not be used by the aggressor to weaken or discredit our country”. Earlier this month, Ukrainian authorities raided several Orthodox churches aligned with Russia as religious tensions between the two countries grew. The Russian church and the Kremlin have both said they fear Kiev will use force to wrest Moscow-loyal churches and monasteries into its control. Ahead of the council, Russia’s Patriarch Kirill appealed to the Pope, the United Nations and others in the West to defend his church in Ukraine from “persecution”. Kiev officials have framed the Church issue as one of national security, with Poroshenko in the past referring to the branch loyal to the Moscow Patriarchate as a “threat”. The synod comes shortly after a maritime crisis that saw Russia seize three Ukrainian navy ships and arrest 24 sailors in the waters around Crimea. If the attempt to create a unified Ukrainian Church is successful, it would be among the largest in the Orthodox world in terms of number of believers. Email “Ukraine Orthodox priests to establish church independent from Russia ”. Feedback on “Ukraine Orthodox priests to establish church independent from Russia ”.